Irreparable disaster befell Russian arms in May, 1915, when a tornado of shell-fire from 3,000 heavy German guns ripped open a 40-mile gap in the Russian front, along the banks of the Dunajec and Biala Rivers, blowing General Dmitrieff's army into oblivion and compelling the entire Russian line to fall back into the far interior, with a resultant loss of 350,000 in killed and wounded and 1,250,000 prisoners. Her tremendous victory gained for Germany possession of 100,000 square miles of Russian territory, comprising all of Poland and Courland, the greater part of Galicia and several other large provinces, whose aggregate population was 20,000,000. This disaster, which bore fruit two years later in red revolution and the quick collapse of the Russian Empire, was due primarily to Russia's inferiority in guns and lack of ammunition, which left her impotent before Germany's unparalleled concentration of artillery on the most vulnerable point in the Russian line. The European Allies for months had been endeavoring to get munitions into Russia. The only practicable route for the transport of supplies from the West was through the Dardanelles and Bosphorus, past Constantinople and thence by way of the Black Sea. The failure of the Dardanelles and Gallipoli campaigns had definitely closed this route to the Allies. One other entrance into European Russia, from Vladivostok on the Pacific Coast over 6,000 miles of Trans-Siberian Railway to Moscow and Petrograd, remained open. The Japanese had availed themselves of this route in sending $40,000,000 worth of guns and shells into Russia, but since February the Japanese had been at controversy with China and their exports of munitions were suspended while they made provision for their own needs in case war broke out with China. After the quarrel with China had been composed, Japan resumed her export of munitions, but these later supplies failed to arrive in time to save the Czar's armies. Consequently Russia for months had been without adequate military supplies. The United States Government subsequently came to Russia's rescue by sending 20,000 American freight cars and 400 American locomotives to the port of Vladivostok in order to facilitate the shipment of guns and shells over the Trans-Siberian Railroad. Thanks to this timely aid, Russia was able to recover from her defeat and for a time resume the initiative. The combined armies of Germany and Austria had hitherto failed, after four consecutive attempts, to break through the Russian front by way of the Warsaw salient. They now planned to launch a surprise attack in another direction, further south. Hindenberg had discovered a more vulnerable point in the Russian line, where it bent along the banks of the Dunajec and Biala Rivers, just below Tarnow in Western Galicia. This sector, some 40 miles long, was thinly held by an army of 200,000, commanded by General Dmitrieff, a Bulgarian officer in the service of Russia. Not only was this sector insufficiently covered with troops, but Dmitrieff had neglected to prepare suitable lines of defense in his rear. Knowing these facts, the Germans decided that this was the place to launch a surprise attack which would carry ampler promise of victory than did the Warsaw sector. For weeks they were secretly engaged in bringing forward to the Dunajec sector the greatest assemblage of artillery ever known in warfare. Under cover of night, they had gradually concentrated 4,000 heavy howitzers and field guns of every caliber, together with 10,000 machine guns, in front of Dmitrieff's position. Huge ammunition depots uprose behind the German lines. Food depots were constructed, hospitals erected and an intricate telegraph system set up. Great droves of cattle were brought forward to insure an adequate supply of meat. Finally, an army of 750,000 specially trained troops, under command of General Mackensen, was secretly massed east of Krakow, prepared at a signal to pour through the gap which the German artillery would open in the Russian line. All these extensive preparations went on unnoticed by General Dmitrieff. In May, a month made otherwise memorable by the sinking of the Lusitania and the entrance of Italy into the World War, the Germans were ready to hurl their thunderbolt at Russia. 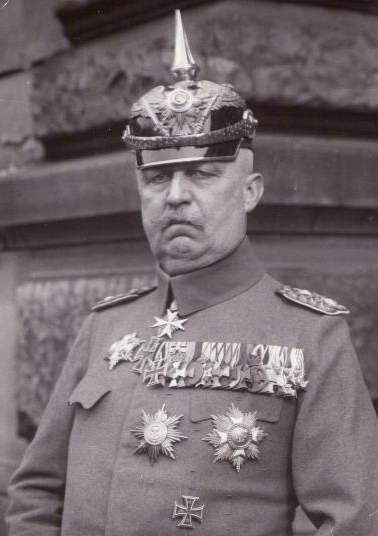 At this time the 700- mile battle front, extending from the Baltic Sea to the Carpathians, was occupied by 3,000,000 German and Austrian troops, divided into three groups of armies, all under the supreme command of Field Marshal von Hindenberg. 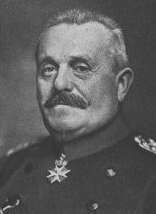 At the Northern end of the line, in East Prussia, and prepared to undertake a raid into Courland, there was an army group commanded by General von Below, under Hindenberg"s immediate observation. In the center of the long battle line, along the Polish border, was a group of armies directed by Prince Leopold of Bavaria. Southward, in Western Galicia, an army group led by General Mackensen was acting in co-operation with the armies of Archduke Frederick of Austria. The Russian trenches were held by some 2,500,000 troops, many thousands of whom lacked rifles and all of whom were in need of ammunition. The supreme commander was the Grand Duke Nicholas, uncle of the Czar. The three principal Russian Army groups were commanded by General Alexeieff in the North, General Ivanoff in the Center and General Brusiloff in the South. At the beginning of the great battle, only the troops in the Galician sector were fully engaged. On THE morning of May 2, 1915, the roar of 4,000 howitzers and field guns announced that the battle had begun. In the space of four hours, 700,000 shells were hurled at the Russian line, obliterating the trenches on a 40-mile front and blowing the greater part of Dmitrieff's army into eternity. Everything within the range of shell-fire was swept away—trees, wire emplacements, horses, vehicles and 150,000 men. Many who retreated from this inferno were caught in a cascade of shell-fire that fell upon the terrain at the rear of the main position. A mere remnant of Dmitrieff's army effected their escape from the slaughter pen at Gorlice, retreating in confusion toward the Wisloka River. Mackensen's Phalanx of shock troops quickly pushed through the gap in the line and, separating into two columns began a wide enveloping movement in conjunction with the army of Boehm-Ermolli They planned to capture, not only the remnant of Dmitrieff's army, but the whole of General Brusiloff's army on the right. Dmitrieff's shattered army defeated this scissor-like movement by the stubbornness of its resistance, fighting rear-guard actions as it retreated, and enabling General Brusiloff to escape from the trap set for him. The Bavarian and Hungarian Armies, under General von Emmich and General Marting, strove mightily to reach the Western passes of the Carpathians before Brusiloff could effect his withdrawal, but he managed to elude them, though with a loss of 30,000 men. A New Russian line was formed on May 5, 1915, along the banks of the Wisloka River, and reinforcements were sent to the armies of General Dmitrieff and Ewerts. The German siege guns were again trained on the luckless Russians, who had but little artillery and less ammunition, to sustain the attack. Nothing daunted, General Ivanoff's Caucasian Corps, 50,000 strong, with their daggers and bayonets only, charged full upon the powerful German batteries, capturing one of them and taking 7,000 prisoners. After five days of savage fighting, the line swaying backward and forward across the river, the German artillery fire prevailed, and the brave Cossacks were forced to retreat with a loss of 20,000 men. With the fall of Jaslo, on May 7, 1915, before the assault of General Mackensen, the whole defense of the Russians on the Wisloka collapsed and the Russians began a general retreat to a new position behind the San River, which they reached on May 12, 1915. In their retreat, the Russians had lost most of their artillery, but they had taken a toll of 130,000 dead or prisoners from the Germans, while their own losses were not less than 100,000. Mackensen's army reached the San River on May 14, 1915, and two days later they forced a passage of the river at Jaroslav, compelling a further retirement of the Russian Army in that sector to the Grodak Lakes west of Lemberg. The Germans now aimed at cutting the line to the Przemysl. While Mackensen's army was seeking to envelop Przemysl from the North, the Austro-Hungarian armies in Galicia had crossed the San River and advanced north to complete the encirclement. On May 15, 1915, the Austro-German troops, by enormous sacrifices, hacked their way through the Russian trenches and barbed wire entanglements in their effort to reach the railway. Subsequently, these trenches were recovered by the Russians, but on May 19, 1915, the Austrians regained them and two days later were threatening the Russian line of retreat. Boehm-Ermolli meanwhile was approaching the town from the south and other German- Austrian armies were pressing in from the West. The Russians, on May 24, 1915, in the hope of saving the garrison at Przemysl, launched a counter-offensive. Its chief incident was the storming of Sieniava by Ivanoff's corps on May 27, 1915 and the capture of 7,000 prisoners. Przemysl was now invested on three sides, shells were cascading in the town, and the Germans had all but closed the sole avenue of Russian escape. But in the night the Russian garrison quietly withdrew, leaving a few gunners behind to protect their retreat. On June 2, 1915, the Germans swarmed into Przemysl, finding their prey gone. The Germans paid dearly for their victory, losing in all their campaigns in Galicia 600,000 troops in killed or captive. The Russian losses were 300,000. Though forced into a general retreat, the Russians still were hitting back hard at the Huns. General Ewerts had smashed Archduke Joseph's army at Rudnik, almost annihilating three Austrian regiments and taking 4,000 prisoners. 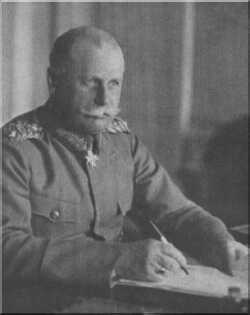 General Boehm- Ermolli's army was badly mauled on the road from Moscika to Lemberg after failing to storm the Russian positions by mass attacks. General von Linsengen, crossing the Dniester at Zuravno, was balked in his attempt to flank Brusiloff's army. Mackensen's army alone, with its 4,000 heavy guns, was able to batter the Russian line. On June 7, 1915, was begun one of the most spectacular battles of the retreat. Between Rawa-Ruska and Lemberg, on the line of the Lubaczovka River, General Mackensen with 500,000 men assaulted the Russian front. The battle raged furiously for a week, but finally on June 15, 1915, the incessant shell-fire and asphyxiating bombs opened a gap in the Russian line, through which the German Phalanx poured in great flanking movement. In this crisis, three regiments of Cossack cavalry, under General Polodchenko, charged like a whirlwind against the German masses, sabering them right and left and putting thousands to rout. Then, swerving to the rear, they put the German Reserves to confusion, capturing many machine guns, and sabering their way back to their own lines. In this daring exploit, the Cossacks lost only 200 in killed and wounded. It seemed to have weakened Mackensen's nerve; at any rate, General Ivanoff was enabled without molestation to withdraw his army 20 miles behind the Dniester River to a fortified position. Lacking heavy artillery, and with less than half their infantry supplied with rifles and ammunition, the Russians could not hope much longer to stay the German-Austrian advance. 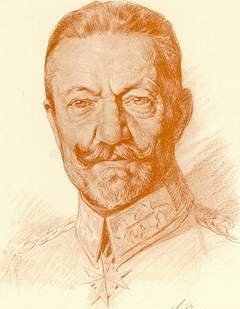 General Ivanoff wisely decided to evacuate Lemberg on June 17, 1915, taking with him all his stores and baggage. 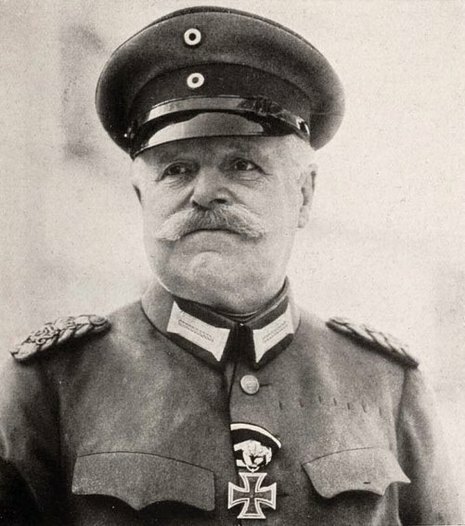 General Boehm-Ermolli led his battered Austrian corps into the town on June 22, 1915, meeting with no resistances. General Ivanoff gradually withdrew to the line of the Bug River, with Boehm-Ermolli in pursuit. Southeast of Lemberg, Ivanoff turned upon him, annihilating one of his divisions of 25,000 men. The Russians finally retreated behind the Sereth River, leaving the Germans in possession of Galicia. All the territory which Russia had gained in an eight months' campaign had been recovered by the Teutons in eight weeks. The Russians had lost nearly 800,000 men; one whole army had been destroyed, and their grip on Austria had been removed. The Teutonic Allies lost nearly 1,000,000 men in these engagements along the whole battle line. Meanwhile, the German-Austrian advance into Poland was progressing. At Krasnik, on July 2d, the army of Archduke Joseph of Austria, while advancing toward Lublin, was halted by a Russian Army under General Loishche. Three days later, the Archduke fell back upon an intrenched position north of the town, losing 15,000 men. The Russian losses were 8,000. The army of General Mackensen also was stopped near Krastnostav on July 7, 1915. For a week, or more, comparative quiet prevailed along the entire Eastern front. Then, on July 13, 1915, the army of General Gallwitz, supported by the army of General von Scholtz, launched a sudden assault on Przasnysz, now a mass of ruins. In the sector north of the city, the Russians had constructed a strong system of fortified positions. For miles in either direction there extended a series of parallel trenches, with bombproof dugouts deep underground. Millions of bags of sand were used as breastworks and in front of this barrier were piled hundreds of thousands of tree trunks. In addition there were many lines of barb-wire entanglements. Instead of attacking the position from the front, General Gallwitz aimed simultaneous thrusts at the two flanks, preceded by a heavy bombardment of the whole line of trenches. The plan succeeded, and the Russian defenders barely had time to evacuate their trenches before the German pincers closed in upon Przasnysz. The Russians then fell back to the Narew River line, the last refuge in the Warsaw salient, closely pursued by the Germans. The entire Russian line, from Courland to the Polish frontier, was now being assaulted. General von Below, on July 17, 1915, in far away Courland, had defeated the Russians at Alt-Auz. On the same day General von Woyrsch, in his advance on Ivangorod, pursued a Russian Army across the Ilzanka, while General Mackensen had compelled the Russians to evacuate Krastovor. Farther to the east, the Austro-Hungarian troops had crossed the Bug and Wolica Rivers. 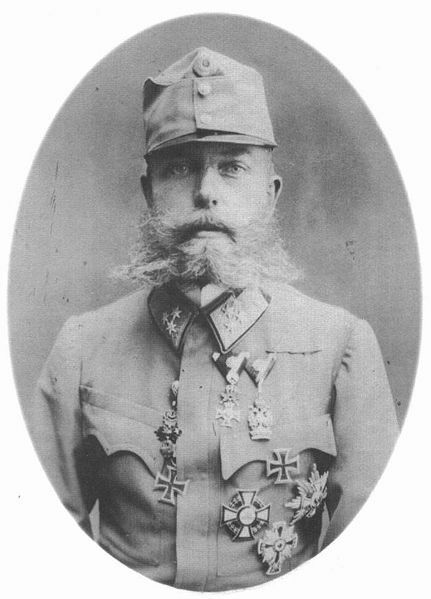 Archduke Joseph, on July 16, 1915, made ten separate assaults on the Krasnik-Lublin line, but was repulsed. The Russians, on July 19, 1915, retreated along the whole front from the Vistula to the Bug. One by one the defensive fortresses were falling. ON July 21, 1915, the bells in all the churches throughout Russia clanged a call to prayer for 24 hours' continual service of intercession for victory. Hour after hour, in spite of the heat, the people stood wedged in the churches while the priests and choirs chanted their litanies. While Russia was praying for deliverance from the Huns, the iron circle was closing in upon Warsaw. Lublin, Zamost and Nistau successively were captured. On July 28, 1915, General Woyrsch's army crossed the Vistula and threatened the Warsaw-Ivangorod Railroad. Four days later 100,000 Germans occupied the right bank of the Vistula. Ivangorod surrendered after a violent bombardment on August 4, 1915. Rather than risk the bombardment of the city, the Grand Duke Nicholas wisely decided upon the evacuation of Warsaw. Lack of ammunition was also another deciding factor in the retreat. Before quitting the city on August 3 and August 4, 1915, however, the Russians had stripped it bare of all metals, such as church bells and machinery, that might possibly be of service to the Germans. All the crops in the surrounding fields had also been destroyed. At 3 o'clock on the morning of August 5, 1915, the last of the Russian troops had departed, after blowing up the bridges. Three hours later, the army of Prince Leopold of Austria occupied the city. He found it practically deserted. The citizens, to the number of 500,000, had fled into Russia, leaving behind in Warsaw a sprinkling of Poles and Jews. In the campaign which ended in the capture of Warsaw, 5,500,000 troops were engaged. The losses totaled 1,500,000, about equally divided between the two combatant forces. After the evacuation of Warsaw, the Russian Armies fell back to a new line of defences, girdled by fortresses, stretching from Kovno in the North to the Roumanian border. The rupture of the Warsaw salient at its apex compelled the retirement of the Russian Armies from Russian-Poland. How to save his retreating armies from capture or annihilation was the problem which Grand Duke Nicholas had to face. His retreat was a masterpiece of strategy. The whole Eastern war front, at first 700 miles long, was gradually shortened to 600 miles by the end of October. 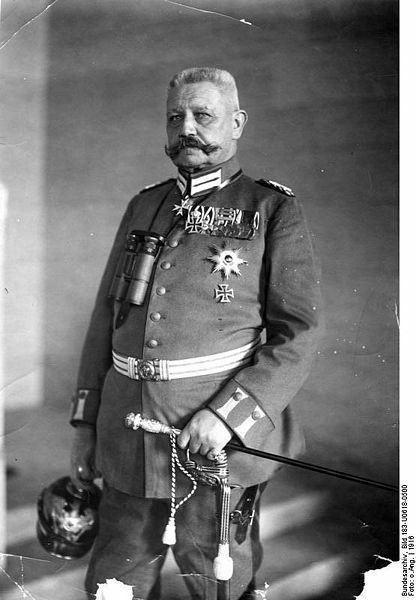 At the north of the line, from the Gulf of Riga to Novo Georgievsk, Field Marshal Hindenberg with four German armies, faced General Alexeieff with a group of Russian Armies. 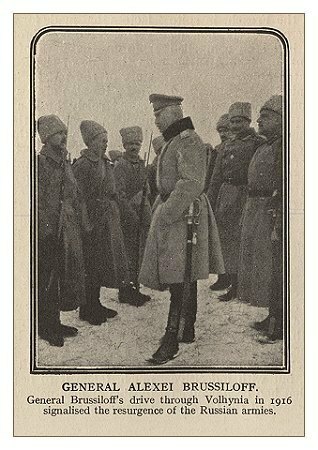 In the center of the Eastern battle-front, Prince Leopold's armies faced the Russian group directed by General Ewerts. At the Southern end of the line, the armies of General Macken- sen and General Ivanoff were in opposition. 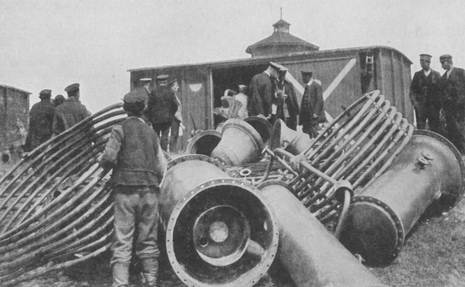 The Germans and Austrians were well supplied with cannon and ammunition, while the Russian supplies failed during critical periods. Hindenberg launched his first attack on the strong Kovno Fort on August 8th, at the same time sending out two columns of troops to cut the Warsaw-Petrograd Railway and seize Lomza. Kovno, with its eleven outlying fortresses, held out until August 18, 1915, when it surrendered under circumstance implying treachery. Indeed, the commander at Kovno, was afterward courtmartialed for treason. The fort yielded the Germans 400 guns and 4,000 prisoners. Two days later, Novo Georgievsk, then in flames from the bombardment, surrendered with 700 guns and 85,000 prisoners. Emperor William and the German General Staff graced the occasion with their presence. The fall of Kovno rendered necessary the withdrawal of all Russian forces along the Niemen sector. Their retreat to Vilna was safely affected. Grodno, the last stronghold on the Niemen, was invested on August 31, 1915. The Germans had brought up their heaviest siege guns for this purpose and a terrific bombardment followed for two days. The Russians quietly evacuated the fort on the night of September 1, 1915. When Hindenberg's army entered the fort on the following day, they found the place vacated. 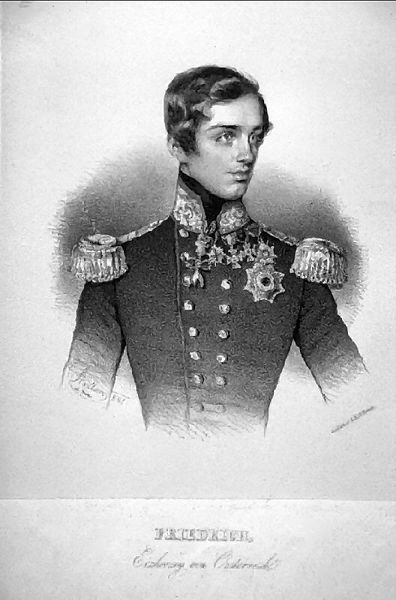 Grand Duke Nicholas, though he had outgeneralled Hindenberg and Mackensen repeatedly, was now deposed as chief commander of the Army and appointed Viceroy of the Caucasus. The first murmurings of red revolution were heard in Russia and Czar Nicholas thought that, by taking chief command himself, he might be able to restore the weakening morale of the Army and the nation. Accordingly, by Imperial ukase, dated September 5, 1915, the Czar assumed personal direction of the Armies of Russia, naming General Alexeieff as his Chief of Staff. The Balkan situation now claimed the attention of the German high command and the pursuit of the Russians was abandoned. 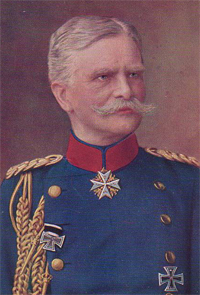 General Mackensen, with four German armies, withdrew from the line and started for the Danube front. The German line was reorganized into four army groups : One, under Hindenberg, occupying a front extending from Riga to the Niemen; a second, under Prince Leopold of Bavaria, from the Niemen to Pinsk; a third, under Linsengen, from Pinsk to Rovno, and a fourth, under the Archduke Frederick, from Rovno to Bukowina. Under the Czar's leadership, the morale of the Army seemed to improve and ammunition now began to flow to the armies. General Brusiloff, on September 8th, smashed a German column near Tarnopol, capturing many guns and 17,000 prisoners. The investment of Vilna began on Sept. 15th, with the bitterest fighting of the whole retreat. Enveloped on three sides with its path of escape occupied by massed cavalry, the Army of Occupation fought its way out to the great chagrin of General Eichhorn, the "conqueror," who forthwith occupied the city on September 18, 1915. A joint naval and land attack on Riga was launched by the Germans, but their attempted landing at Pernau was blocked. The attempt to bombard Riga was repulsed by the Russian Baltic Fleet, the Germans suffering heavy losses. Brest-Litovsk, Lutsk and Dubna fell to the Germans in quick succession. By The end of September, the Russians were able to establish a strong line from Riga to Dvinsk along the River Dvina. This line was protected at Riga by the guns of the fleet, and at Dvinsk by the Petrograd Railway. Repeated attempts were made to pierce the new line at Dvinsk, but without success and the Germans suffered heavily in each attempt. The German advance had been finally stopped. Although several minor engagements were fought along the line during November, no battles of importance resulted. During the retreat, the Russians lost 1,250,000 in prisoners and 350,000 in dead and wounded, besides thousands of field guns. They had surrendered 100,000 square miles of territory of the Germans, including all of Poland, but they still were unconquered and their army was intact. Outnumbered, outgunned and victims of basest treachery, the Russian soldiers had given a good account of themselves. The German losses also approximated 1,000,000 on the Eastern front, in prisoners and casualties during the year 1915. On May Day, 1915, a huge German army under Field Marshal von Mackensen attacked the Russian army commanded by a Bulgarian general, Radko Dimitrieff, and standing between the Dunajec and Biala rivers, some thirty miles east of Cracow, well-nigh destroyed it and began that long offensive which was not to end until German armies had penetrated deeply into Russian territory, taken Warsaw and BrestLitovsk, and temporarily paralyzed Russian military power. The Battle of the Dunajec is the second of the great conflicts of the war—the Marne, the Dunajec, and Verdun. These are the great struggles of the first three years and in many respects the Dunajec must rank after the Marne, while viewed from the standpoint of the present hour it seems certain to prove one of the truly decisive battles of human history, for by this disaster were sown the seeds of that Russian Revolution which was to come less than two years later. It marked the decisive step toward the overthrow of the Romanoff dynasty and the consequent total transformation of the character and prospects of the war on the eastern front and, in a sense, of the whole war. Just as the Battle of the Marne supplies the central unity of the first phase of the war, the Dunajec furnishes the same central point for the second. All the campaigns and all the important developments derive their chief significance from this great struggle, which (so remote did the Galician field seem to the world at the moment) appeared insignificant beside the barren trench struggles about the ruins of Ypres. The conditions under which this battle were fought are simply told. From the Battle of Lemberg onward Germany had sought steadily to bolster up the shaken Austrian armies. She had endeavoured by one costly offensive after another, directed at Warsaw from her own territory, to relieve the pressure upon her ally, throw the Russians back behind the middle Vistula and the Niemen, and compel them to give over their great effort to crush Austria. None of these efforts had been a complete success nor yet a total failure. The victories of Hindenburg at Tannenberg and the Masurian Lakes had taken a terrible toll of Russian troops. Russian victories over the Austrians at Lemberg and afterward just missed dealing the final blow to the Hapsburg armies because of German aid promptly given and efficiently administered. But long before spring came the Germans had recognized that it was no longer possible to save Austria by offensives directed from Breslau, Posen, or East Prussia upon Warsaw. They had perceived, too, that it was not going to be possible to renew their bid for a decision in the west until they had settled with Russia by inflicting a sweeping and complete defeat upon the Czar's armies, which should eliminate them from the reckoning and might procure a separate peace by producing such a revolution within Russia as would dispose of the Slav enemy for the duration of the war. At the least they were now determined to drive the Russian armies from Austrian territory and so disorganize their military establishment as to gain time and opportunity to go west again. Having resolved that their major campaign for 1915 should be made in the east the Germans had to decide at what point they would make their main offensive. The failures along the Niemen-Narew-Bobr line from Grodno to the Vistula, the bloody repulses on the Bzura-Rawka front, had exhausted the possibilities on the north and in the centre. Despite all efforts, these attacks had been repulsed and Russian pressure upon Austria had continued. Nor was there a more shining opportunity to be found far to the south on the Rumanian frontier. To attack here was still to permit the Russian pressure, the main thrust at Hungary, to continue. Equally unattractive was the front along the Carpathians, for here the Russians, even were they driven back, would be able to maintain a long and costly defence in the Dukla and Lupkow Passes, possessing communications behind them and already holding the crests of the range along the portion of the mountain front which was available for operations. The decision of the Germans was therefore for the front between the Carpathians and the Vistula, where the Russian line, having made the great "elbow" west of the Dukla Pass, ran straight to the north. Could they break the Russian line here, the Germans would threaten the rear and communications of the armies fighting along the Carpathians, particularly that of Brusiloff. Here they might hope to achieve, as they did in fact almost achieve, another Sedan, but they could be assured that in any event a successful penetration of the Dunajec line would cause the collapse of the whole Russian front from the upper Vistula to Rumania, with the consequent liberation of most of Galicia. The method by which the German sought to attain his goal is of supreme interest because it reveals a new form of warfare. It was repeated in every detail at Verdun and in a modified form at the Somme, and an examination of the system sheds invaluable light on the later struggle. It represented the application of new weapons and new discoveries to the art of war and it is a landmark in military history, on the scientific side. All the battles that came after this struggle for the next two and a half years were in the main of the same type. At Neuve Chapelle Field Marshal Sir John French had almost achieved a major success, the actual breaking of the German line by means of massed artillery bombardment. On a front of less than a mile he had concentrated three hundred guns. The storm from this artillery} the "drum fire" of this unprecedented concentration, had swept away the German trenches and the German barbed wire. The road to Lille had been open for hours after this tornado of shells and it was the failure of reserves to arrive that had spoiled the best chance the Allies were to have for more than two years to break the German line from Switzerland to the sea. The method of French was now adopted by Mackensen, but it was magnified to colossal proportions. In place of three hundred guns, the Germans transported to western Galicia not less than two thousand, many of them of the heaviest calibre, and behind them they massed a head of shells previously unprecedented in war. What Sir John French had done to a mile of German front in Flanders, Mackensen now purposed to do to many miles of the Russian front. Nor was this all. Having broken the lines before him he purposed, still moving his heavy artillery forward, to continue to break down and destroy each successive line on which the Russians might rally. He had thus fashioned a mobile battering ram. And behind the ram were many corps of the best German troops. For this campaign the pick of German first-line troops had been selected. The army that Mackensen commanded was probably, given its size, the best army that Germany had put into the field, for despite heavy losses her military machine had not yet begun to break down through wastage of its officers and annihilation of its youth. The mission of this army of attack, Mackensen's "phalanx" as it presently came to be described, was to finish the work begun by the guns, to stamp out the last feeble resistance, and sweep on as a wave might rush through a dike already undermined by dynamite. There was no intention that this army should extend its front; it had no part in the work of the flanks; it had no part in the work of the regular forces holding the line before it attacked. Its mission was to batter its way, steadily, irresistibly, through the Russian positions, always attacking on the narrow front which could be prepared by the guns. The effect of this strategy is easy to grasp. Right and left of the sector attacked Russian armies stood firm, even took the offensive, but the Russians could not concentrate guns or munitions to meet this main thrust and each time they endeavoured to stand before it their line was crumpled up under the storm of shells that fell upon it. And when this line had crumpled, the "phalanx" pushed through and opened a new breach, which compelled a reorganization of all the Russian front to conform to the retreat of the army which yielded to the main German thrust. Time and again Russian armies north and south of Mackensen's operative front swept forward, defeated and drove German and Austrian troops, winning victories of considerable magnitude, taking thousands of prisoners, but always on the morrow of such successes they were faced with the fact that this Mackensen "phalanx" had pushed forward over another barrier, broken the Russian centre between the mountains and the Vistula at a new point, and the wings had to retire to keep their alignment with the centre. Actually there was something glacierlike in this German advance. It was necessarily slow, because the guns could only move short distances in any day, and the transport of munitions became more and more difficult as the Russians destroyed the roads and bridges, but it was always irresistible, it was always beyond Russian resources to halt it, until the hour when it passed the Russian frontier and reached a region destitute alike of good roads and good railroads; then it came to a halt of a necessity. But by this time its work had been done and the task that remained fell to other armies and in another field. When the great blow fell the position of three Russian armies immediately affected was this: North of the Vistula the army of General Evarts stood behind the Nida River, which enters the Vistula from the north near the point where the Dunajec flows in from the south. His troops had enjoyed quiet for a long time and had no further mission at the moment than to hold the sector entrusted to them. South of the Vistula was the army of Dimitrieff, standing behind the Dunajec before Tarnow and thence behind the Biala, right down to the Carpathians. It, too, was charged with a defensive mission merely. The army of Brusiloff, which made junction with Dimitrieff's in the foothills of the Carpathians, faced south, not west as did the other two, and was fighting its way into Hungary. It had forced the Dukla and Lupkow passes and its victorious troops were already almost within sight of the Hungarian plain. This army was the hammer of the Russian military establishment, and Allied capitals all too easily believed that, since it had now passed the crests of the range, the road to Budapest and Vienna lay open to it. compelled Brusiloff to flee a field of victory to escape ruin in consequence of disaster elsewhere, and yet the strain upon Russia of eight months of campaign had been tremendous; Russian supplies of munitions were already beginning to dry up and were presently to fail at the crucial moment. At first only DimitriefFs army was involved in the German attack. Its position was exceedingly good. It had before it the Dunajec River and then the Biala, an affluent coming down out of the mountains. Both streams were in flood as a result of spring thaws. The lines had been very thoroughly fortified and had withstood heavy attacks in the past. Indeed, so successfully had they withstood attack that Dimitrieff had been led into a fatal error and had prepared no positions to the rear, although the Wislok and the Wistok rivers, behind him, offered equally good fronts on which to withstand German attack if the Dunajec line should be forced. Despite the belief at the time, the Russian army at the Dunajec was by no means lacking either in munitions or guns. It had the fair allowance of a Russian army, but this allowance was totally inadequate to face the German concentration. In addition, Dimitrieff had behind him admirable railroad and highway lines. Two trunk lines, one connecting Cracow with Lemberg via Tarnow, the other running from Gorlice to Stryj, supplied his rear. 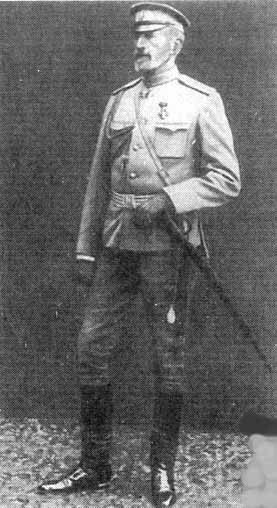 No position of the whole Russian front seemed in the closing days of April, 1915, better calculated to hold, and no general had a better reputation than the soldier who had broken Turkish armies at Lule Burgas and won new laurels in the Lemberg campaign. Was the German attack a surprise? In the main there can be no doubt of it. It was a surprise as Verdun was a surprise. In Galicia, as later in Lorraine, Allied observers had reported German activity. There was a general suspicion that a heavy blow was to fall, but the true magnitude of the blow was not foreseen, could not be foreseen. When it fell it tore the Russian defence into ribbons, just as the later attack tore the French line from Brabant to Ornes into ribbons. On May 2 and 3 the Russian army was in precisely the state of the French army on February 23 and 24 a year later. Fortunately for France she was able to make a new concentration of men and guns a few miles behind the shattered front and pin down the German advance, thus localizing the struggle to the Verdun sector. This the Russians could not do, and, as a consequence, the effect rapidly extended to adjoining armies. The position of Brusiloff's army now became one of extreme peril. The collapse of Dimitrieff's army had exposed his flank and rear; the victorious Germans were nearer to his lines of communication than were his main forces, which were far south of the Carpathians. And the German advance was moving rapidly across his rear with the clear purpose to seize these lines of communication and thus encircle him, throwing Mackensen's forces to his rear, while the armies before him in the Carpathians passed to the attack to hold his troops on their front. Yet Brusiloff did escape and his escape is as brilliant as the similar manoeuvre of Kluck before Paris, when the German general slipped away from the British and brought his troops back to parry and beat down the deadly thrust of the French north of the Marne and west of the Ourcq. Had Dimitrieff taken the trouble to prepare a line behind him at the Wislok, there would have been no great danger to Brusiloff and his retreat might have been deliberate, although there is little reason to believe that the Russians could have fought more than a delaying fight at this stream, for the German artillery concentration was too overwhelming to allow sustained resistance by an army as hopelessly outgunned as the Russian. On May 7 the German advance passed the Wislok at the important railroad junction of Jaslo. The next day the Germans were across the Wistok, another river coming north out of the Carpathians parallel to the Dunajec and the Wislok and again offering an advantageous defensive position, had the Russians guarded against defeat. As it was there was little defence, for there were no trench lines. Brusiloff was now all but enveloped. His position had been a salient at the start and the Germans were almost across the neck of the loop. He was saved because Russian reserves, concentrated at Przemysl, were pushed out along the upper Wistok and succeeded in halting the German drive for a few hours. This gave Brusiloff just time to slip out of the rapidly tightening noose. He did not get all his troops away; a division was caught, many guns and men were lost; but by May 12 his main forces were behind the San, and the Russian front had been restored. It had been restored in the sense that thenceforth the Germans were to face organized resistance—the days after Dimitrieff's collapse, when they had no real organized force before them, were over. So also was the chance of a supreme success, the capture of the Russian armies in the Carpathians. Only once more, this time at Vilna, were the Russians to face as terrible a danger, and there their escape was much easier. The end of the second week in May then sees the Russian armies once more in line. Evarts has retired from the Nida to conform to the retreat south of the Vistula. Dimitrieff's army has ceased to exist, but a new army is in position from the Vistula along the San through Jaroslav and Przemysl to the Carpathians. On this front was fought the Battle of the San, which was a final effort of the Russians to beat down the German thrust, as they had beaten down an Austrian thrust on the same front in the previous year. But the effort was vain. Mackensen had moved his "phalanx" northeastward along the railroad from Gorlice to Jaslo and from Jaslo to Rzeszow, where the branch line joined the main Lemberg-Cracow trunk line. He now forced the passage of the San at Jaroslav and by forcing the line of the San compelled a new Russian retreat, this time to the very gates of Lemberg, to the famous Grodek line, a system of lakes and marshes a few miles west of the Galician capital. Meantime the Austro-German army, which had been holding Brusiloff in the Carpathians, pushed north and struck in the rear of Przemysl, seeking to encircle it from the south, as Mackensen, having passed the San, aimed at encircling it from the north. In the face of this double thrust the Russians clung to Przemysl until June 2, always, however, with the clear recognition that it must ultimately be abandoned. Six weeks after this stronghold had fallen to Russian arms a Bavarian contingent entered the town, on the heels of the Russian troops who just slipped between the sides of the closing neck of the salient and took the road to Lemberg. Meantime, counter-offensives, by Evarts north of the Vistula and by Lechitsky on the front of Bukovina, had won smart local successes, but despite large captures of prisoners these operations could not influence the main campaign. The first days of June saw the Russians standing north of the Dniester and east of the Grodek Lakes. All of western Galicia had been lost and German troops were already across the Russian frontier east of the San. The Galician campaign was entering its last phase. In the Grodek line the Russians occupied the last defensive line covering Lemberg. Of itself the position was impregnable and their southern flank was securely posted behind the Dneister. But if the artillery of Mackensen could not penetrate the swamps and marshes of the Grodek region, there was open to them a road by which they might turn them. Northward from Jaroslav to Rawa Russka ran the railroad down which Russky had come in his great attack of September, 1914. He had turned the Grodek line by coming round the northern end of the swampy country and defeating the Austrians at Rawa Russka. Once he had won a victory about this town, the Austrians had to fall back behind the San. Mackensen simply reversed the proceeding. He moved from Jaroslav north to Rawa Russka, defeated the Russian troops there by means of his heavy artillery, and then began to turn south toward Lemberg and across the rear of the Russian armies. The threat was sufficient. June 22 the Russian armies left the Galician capital, which they had occupied since the first days of September, 1914. All the vast railroad network was restored to Austrian hands. Galicia was reconquered save for a small strip in the east. First taking up their position behind the Gnila Lipa, the line on which the Austrians had defended Lemberg in the previous year, the Russians presently withdrew behind the Zlota Lipa and then to the Sereth, where at last their retreat in Galicia came to an end. Thus, in a campaign of less than eight weeks, Germany had freed Galicia. She had retaken more than 30,000 square miles of territory, with all their valuable oil wells and railroad lines. She had deprived Russia of the fruits of eight months of effort. She had destroyed one Russian army and disorganized three. She had abolished the threat to Austria and regained the offensive in the east. The consequences of Austrian defeat at Lemberg in August and September, 1914, ceased to dictate eastern operations. Austria was saved. Russia was now endangered and the campaign in the east had only begun. Actually the German operation had restored the condition on the eastern front that had existed in the first days of the war. The Warsaw salient, abolished by Russian advance in Galicia, was as it had been when Austria had launched her first blow toward Lublin. The Russians were now in the posture they had foreseen before the war, when they had planned to evacuate Poland and begin their fight along the Bug, a plan temporarily discarded when Germany decided to go west and left to Austria the task of disposing of Russian attacks until German armies had entered Paris and crushed France. The situation of the Central Powers, however, was vastly different from that of August, 1914. Now Germany had great armies in the east, while on the west she was simply seeking to hold her lines and for this utilizing her great superiority in heavy artillery and machine guns. Now that Mackensen had cleared Galicia, Hindenburg was in a position from which he could assail the Warsaw salient north and south simultaneously and at the same time continue pressure at the centre between Warsaw and Ivangorod. In the previous year Russia had been able to put good armies in the field reasonably well equipped for a short campaign. But ten months of battle had weakened these armies; their supplies of munitions were rapidly diminishing; there were lacking guns and equipment for new troops ready to take their place in line. In fact, Warsaw and Brest-Litovsk were already doomed and a Russian collapse was to be prevented now only if France and Britain, by attacks on the west front, could divert German guns and German troops to Artois or Champagne in such numbers as to give the Russians a breathing spell. Only this intervention could deprive Germany of the opportunity to harvest the fruits of her great success, and since no such intervention was possible, the tide of German success was to continue uninterrupted for many months. The Dunajec was therefore the second of the great battles of the war and one of the memorable contests in all military history. It was a Napoleonic triumph in its proportions and in its conception. It must rank in German military history with Tannenberg. The one saved Prussia; the other first rescued Austria, threatened with invasion and destruction, then brought Russia to the point of collapse and then to revolution. Whatever the final outcome of the war, its effect upon eastern Europe was bound to be decisive. For the House of Romanoff, the Dunajec was as fatal as Leipzig proved for the First Napoleon.